How to Stop Emotionally Overfeeding Our Children? National Obesity Awareness Week is from 8-14th January. This is a time of year when many adults resolve to try and lose weight but how can parents help their children to also have a healthy relationship with food? Obesity has dramatically risen in the last fifty years and is a particular concern for children. By age 5, nearly 1 in 10 children are already obese, but by the end of primary school this figure has more than doubled so that 20% of children aged 10-11 are obese. Even worse is that nearly all of these children (80%) will become obese adults. Part of the problem is that nearly 50% of parents are not recognising that their children have a weight issue. It is all too easy for many parents to dismiss the seriousness of this matter. We have all heard expressions such as ‘it is puppy fat’, ‘she has big bones’ or ‘it runs in the family’. However, we need to do something to stop our children facing a life sentence of emotional and health concerns. The good news is that children are more likely to change their eating habits than adults so now is the best time to put things right. We are bombarded with loads of practical advice about how to encourage healthy eating in our children but what about our understanding of the psychology of overeating? At times, every parent has indulged their child by giving too much food or the wrong type of food. This directly increases the risk of obesity as it is not a response to the child’s hunger. Understanding the reasons why parents emotionally feed is the first step to tackling it. Many parents use treats to pacify their child when they have hurt themselves, are upset or angry and if it seems to work they carry on using it. However, a recent Norwegian study found that parents who offered their children food for comfort in their early childhood increased their emotional feeding at age 8-10. By preventing children understanding how to control and identify their own emotions parents encourage them into a lifetime of reaching for food in response to distress or sadness. 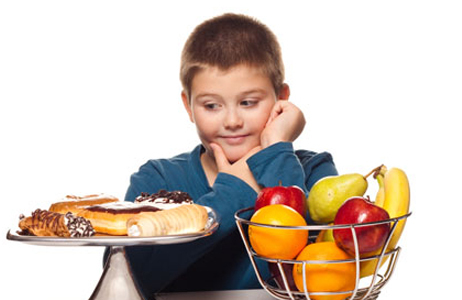 Parents use food as an incentive to control behaviour. For example, doing well in a spelling test or getting your dessert if you clear the plate. This kind of behaviour can sabotage healthy nutritional habits. Food offered as a reward is generally unhealthy and high in calories. Encouraging children to eat when they are not hungry plays havoc with their normal ability to control their appetites. It also gives them mixed messages – ‘bad food for a good deed’. Like comfort it can set up a lifetime pattern of associating treats with certain moods – such as reaching for some chocolate when you feel good about yourself or, as found in a recent study, when feeling stressed. How much trouble do we go to for children’s birthday parties and how much planning goes into the cake? Junk food tastes good and is going to make children happy and like the person who gave it to them. In a review of 56 different studies, maternal grandmothers who provided childcare were found to particularly use this kind of emotional feeding and the grandchildren were 20% more likely to be overweight. Parents need to become aware of the implications of these kinds of behaviours and attempt to find some non-food related alternatives. 1. When comforting a child that has hurt themselves, try using hugs, a favourite soft toy or magic cream to soothe the pain away. 2. For children who are distressed or angry it is important for parents to endeavour to understand and validate their feelings and emotions. Giving your child food to placate them only offers a quick fix and does not really address the heart of the problem. Instead acting as an ‘emotion coach’ by listening first and then talking it through will help your child deal with the real issue. See http://www.educatingmatters.co.uk/blog/category/emotion-coaching/. 3. Parents can reward their children in ways that encourage healthy exercise such as a trip to the park, swimming, playing football or riding a bike. Children are particularly influenced by their parents’ behaviours so your enjoyment and participation will inspire them to be more active. 5. Enlisting the help of grandparents, particularly those who participate in childcare may be a better strategy than asking them to stop giving them treats. For example, tooth extraction is the number one reason young children go to hospital and it could be that the dentist has noticed some tooth decay. You could ask them if they have any dietary suggestions on how to take care of your child’s teeth.